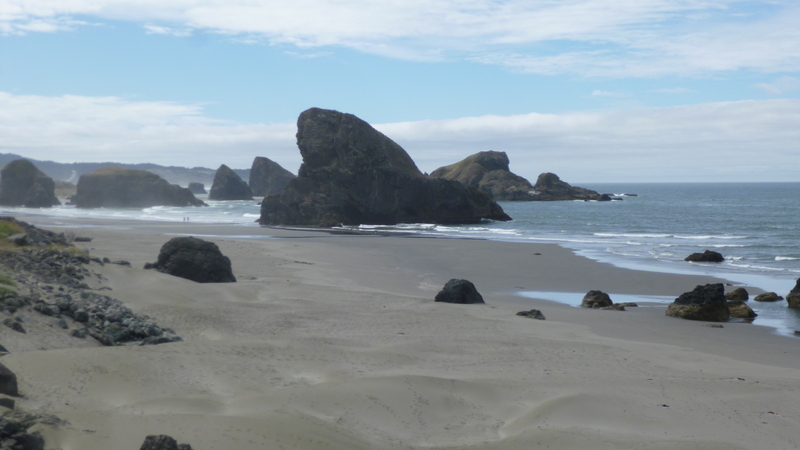 After I got the campsite packed up, I found a little bakery and got a couple homemade huckleberry/white chocolate scones and then I enjoyed a couple more hours of driving right along the Oregon coast. It’s just beautiful, and I made a few stops along the way to enjoy the scenery. 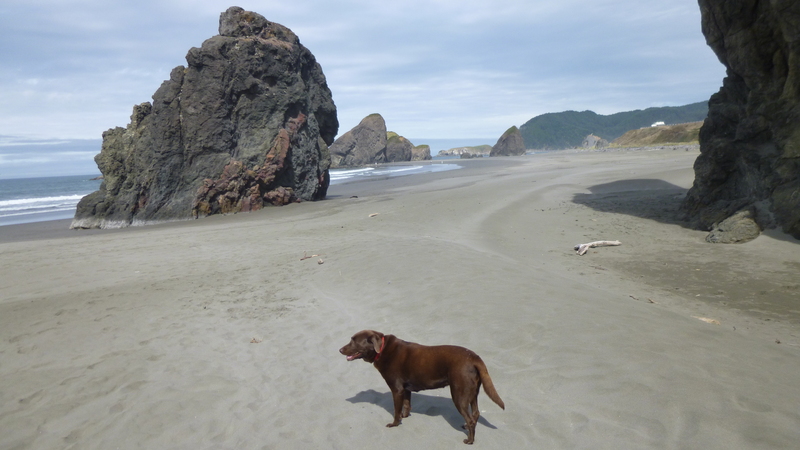 Tula played in the water in one stop, and I was captivated by all the big boulders strewn around. 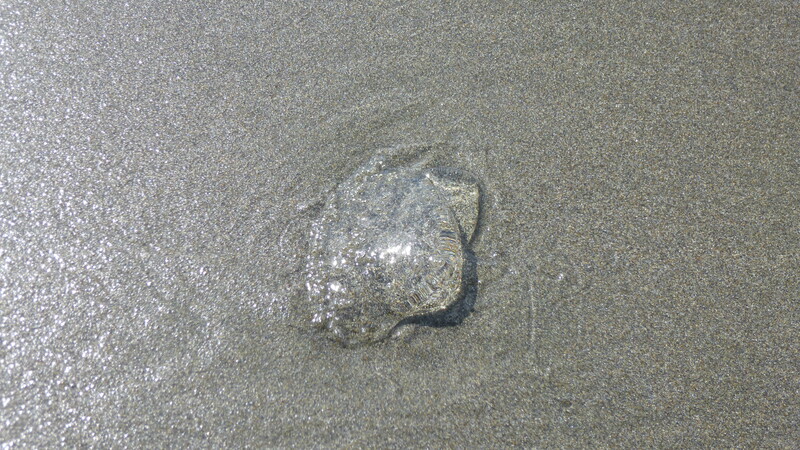 There were some clear jellyfish on the sand – they’re so odd-looking. I was glad I didn’t make this drive last night and miss all the views! 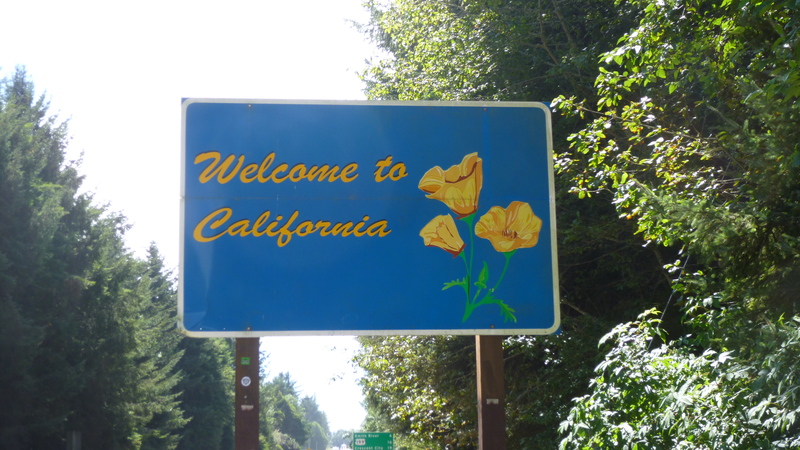 So it was after noon by the time I crossed into California – State #46! California is such a big state that I had been telling people all along that I was just going to concentrate on the northern half of the state – I wanted to avoid the crowds and congestion of southern California and the whole Los Angeles area. 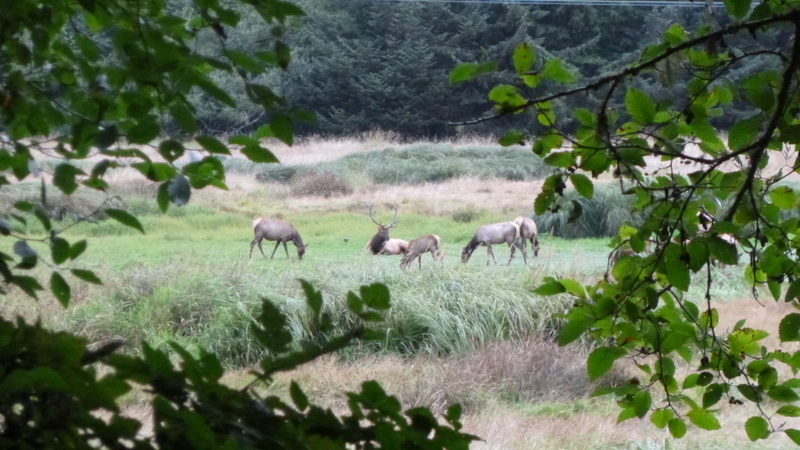 But plans and intentions do have a way of sometimes changing…. 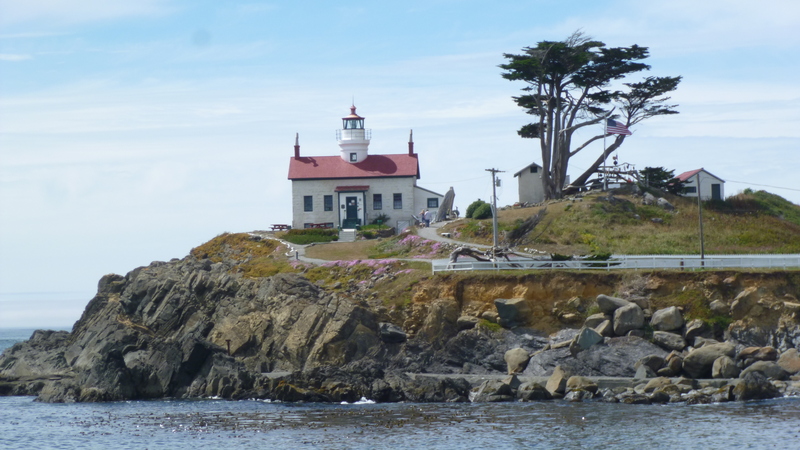 I crossed into California at its very northwest corner, and the first town I came to was Crescent City, which calls itself the Easter Lily capital of the world. 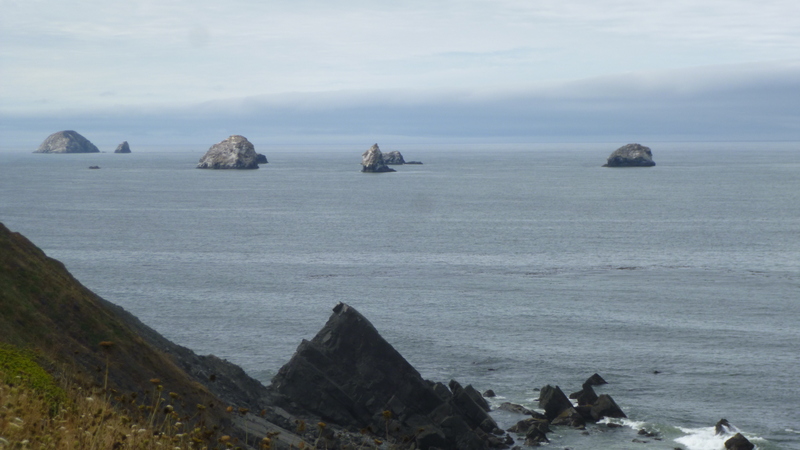 Since it was already after noon, I was hoping to find a donation place in Crescent City, because that part of California is a big wilderness area, and there weren’t many other towns around. 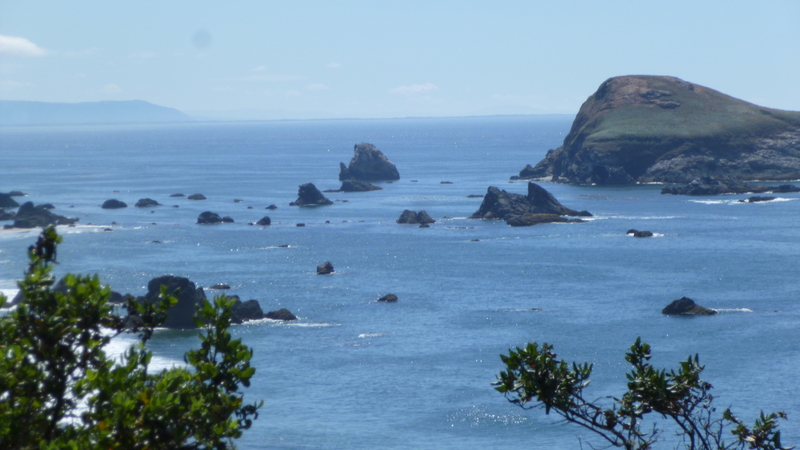 Nothing really jumped out for a donation – I drove past one place, but it wasn’t quite what I had in mind. I decided to just continue on through town. 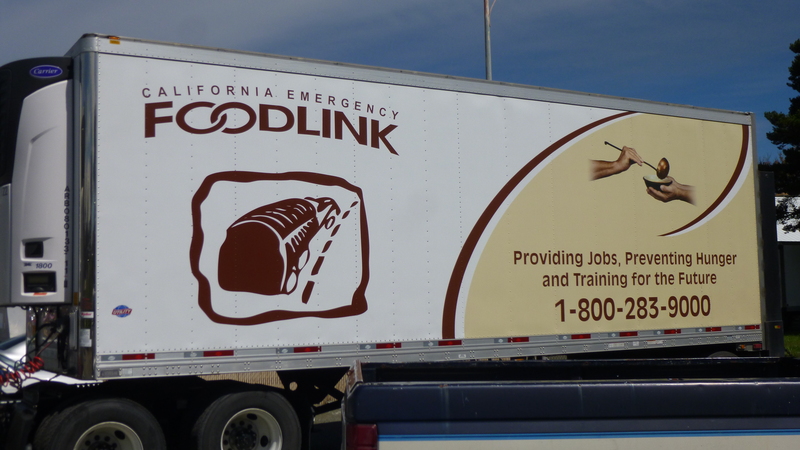 And then I happened to see a big semi-truck in a parking lot, with the name California Emergency Foodlink on it, and there was a long line of people, and that caught my attention. I turned the van around to get a better look. 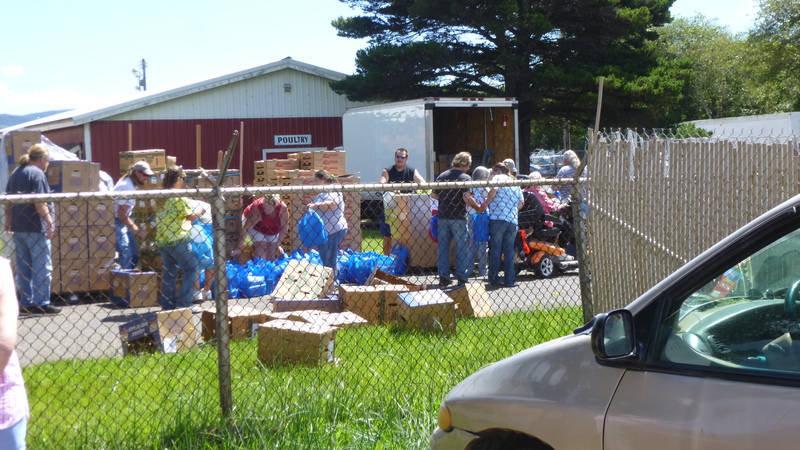 I ended up driving into the parking lot, which appeared to be at the local fairgrounds, and I found someone to ask about making a donation – there was clearly a lot of food distribution going on here. 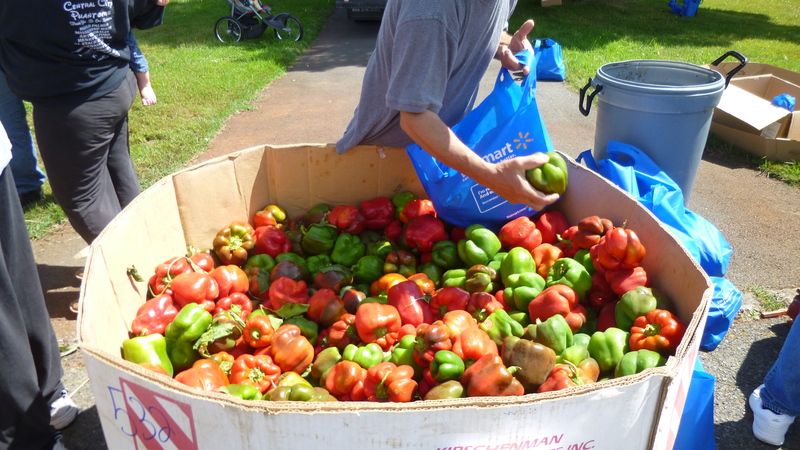 The volunteer found one of the directors, and he told me that once a month from May to October, local farmers and stores gather up excess produce, and bring it to the fairgrounds for a “tailgate” sort of give-away event. Everyone is encouraged to donate their excess food instead of dumping it. 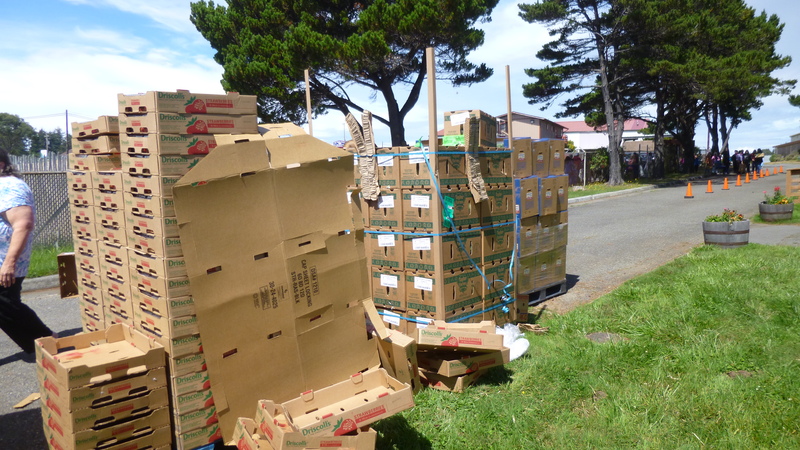 He estimates they help at least 200 people in need during the monthly produce giveaway, and unlike some of the food programs, this one has no requirements – anyone at all can stop by. Even if someone drove up in a Mercedes, there would be no questions asked. 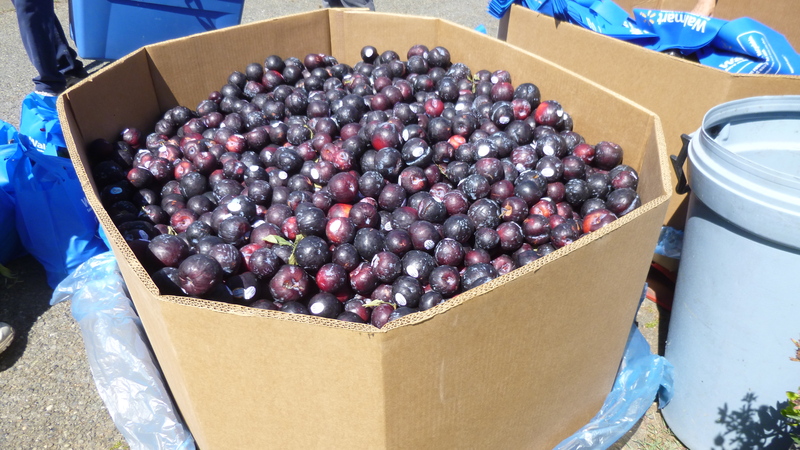 There were huge cardboard bins of plums, peppers, corn, strawberries and other things. And it looked like Walmart provided a lot of blue shopping bags. 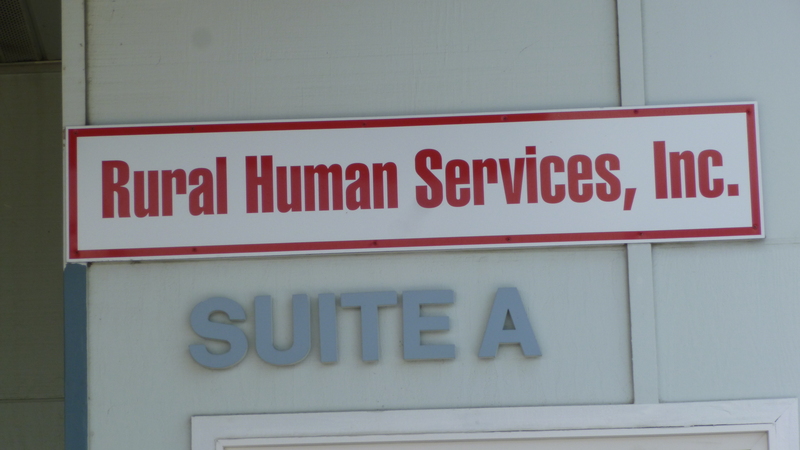 This program is only one of many offered by the local Rural Human Services, and the director told me where the offices were, because it would be better to go make my donation there instead of handing him a check in the middle of the produce giveaway. He sent me on my way with a couple boxes of strawberries, and I found the office and made the donation. 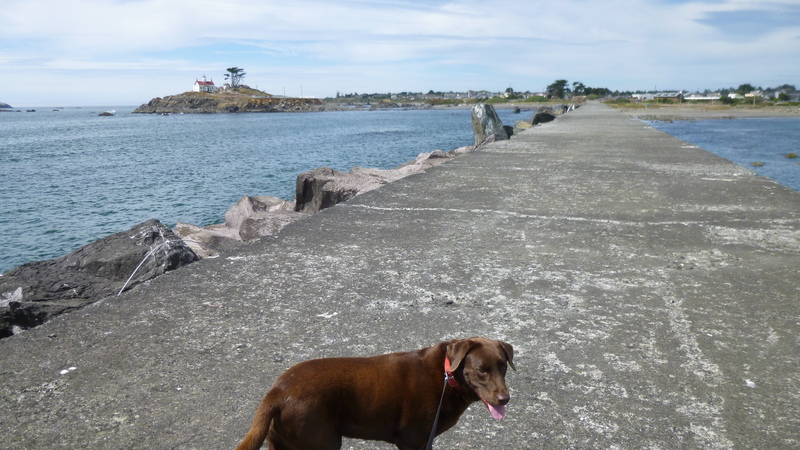 Then it was time for some walking. 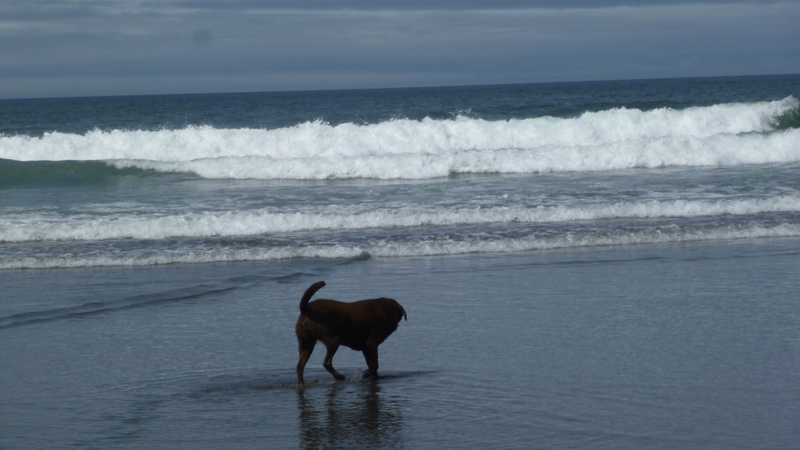 I headed down to the ocean, since that always seems to be a good place to start. 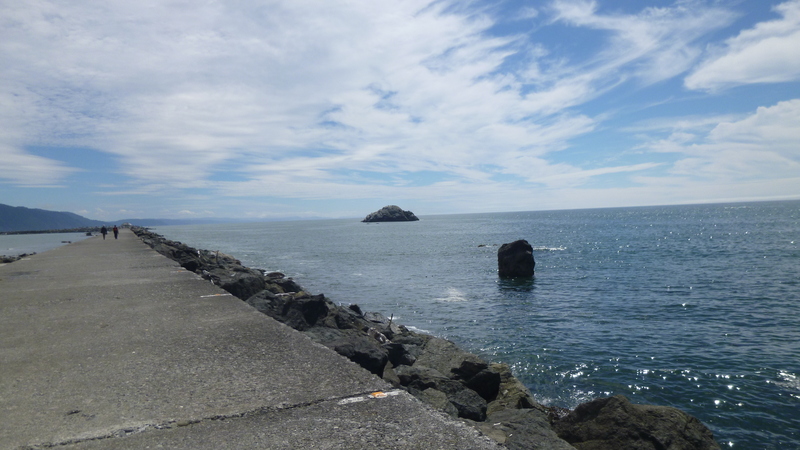 There were some parks, and walking paths, and a long breakwater to walk out onto, and from there I could see a pretty little lighthouse out on the end of a strip of land. We walked a little over 2 miles. 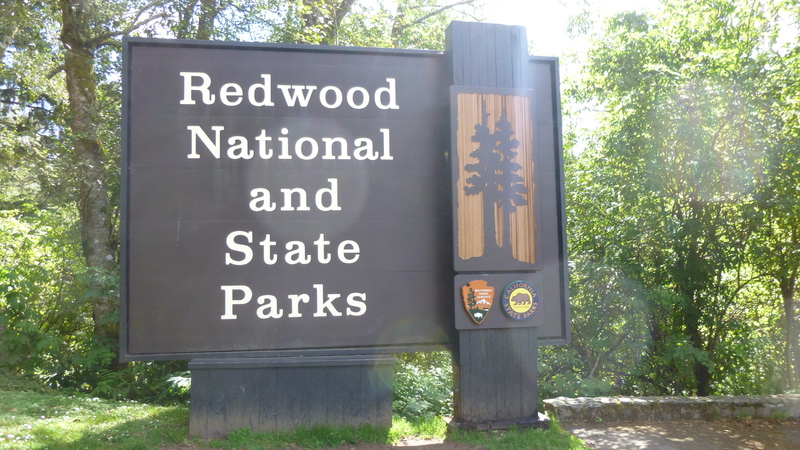 Then I found the visitor center for the Redwoods National and State Parks – it seems to be a combined effort. 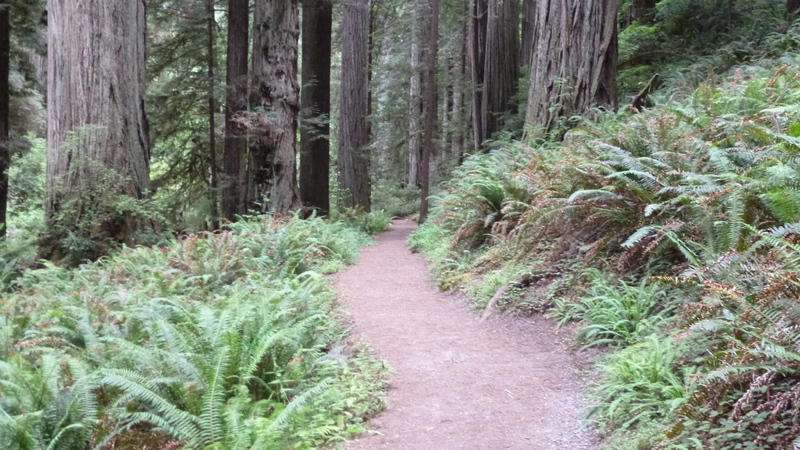 I was really looking forward to doing some walking in amongst some big redwood trees. 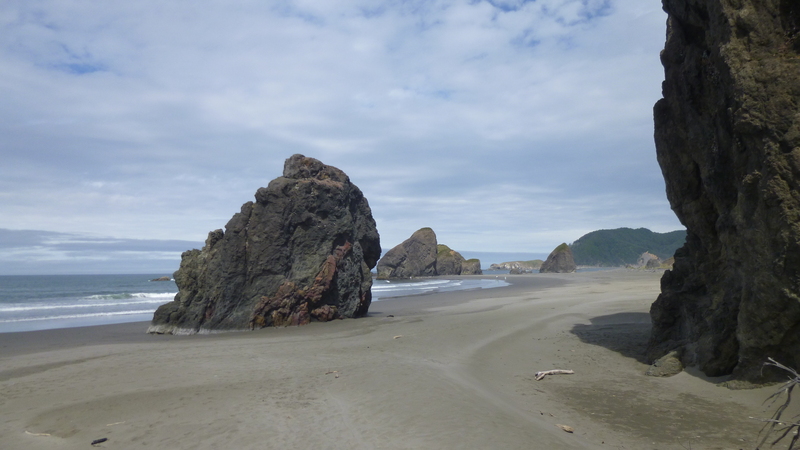 There were several national/state park areas scattered throughout a 60 mile area, and the ranger told me where some good trails were – I just had to drive south a bit. 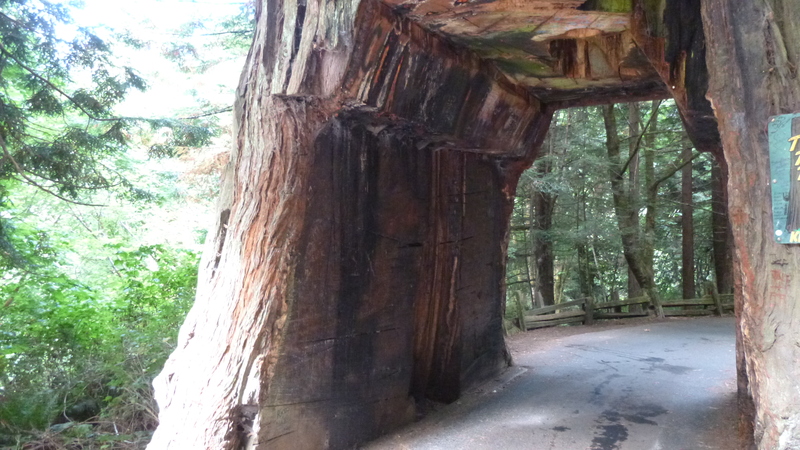 On my way, I saw a touristy sign advertising one of the “drive-thru” trees. 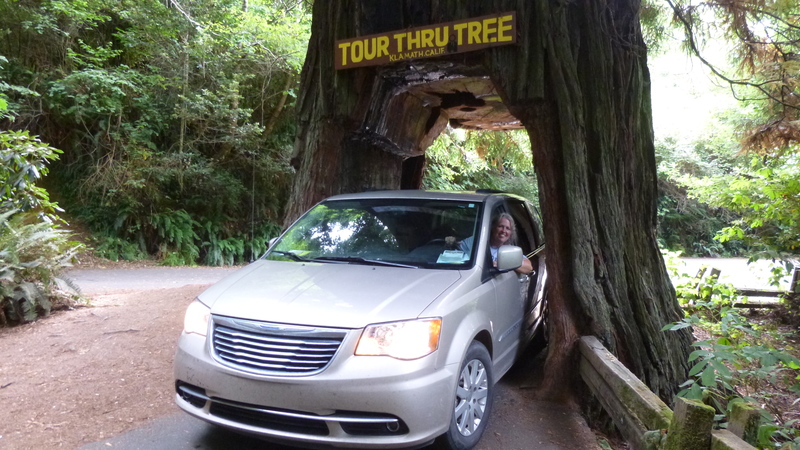 And I couldn’t resist the possibility of driving through a tree. There’s 3 or 4 of them in different locations, and the “holes” in these huge trees were clearly cut out long ago before thoughts of preservation ever kicked in. 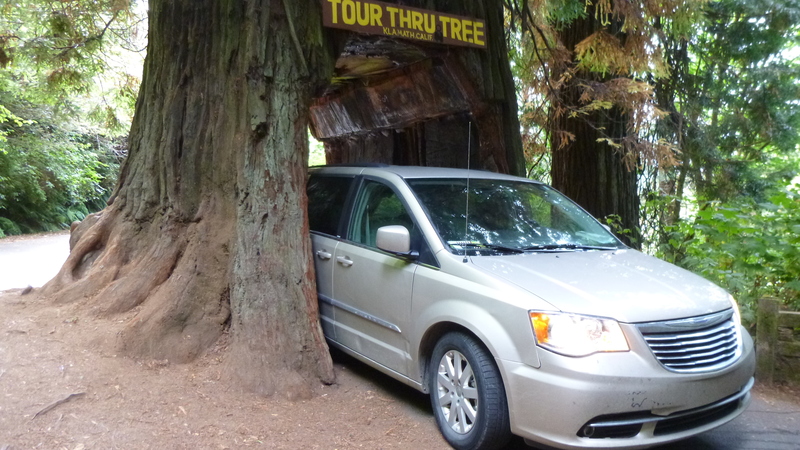 I had to pay $5 for the privilege of driving through the tree, but I must say it was pretty cool. 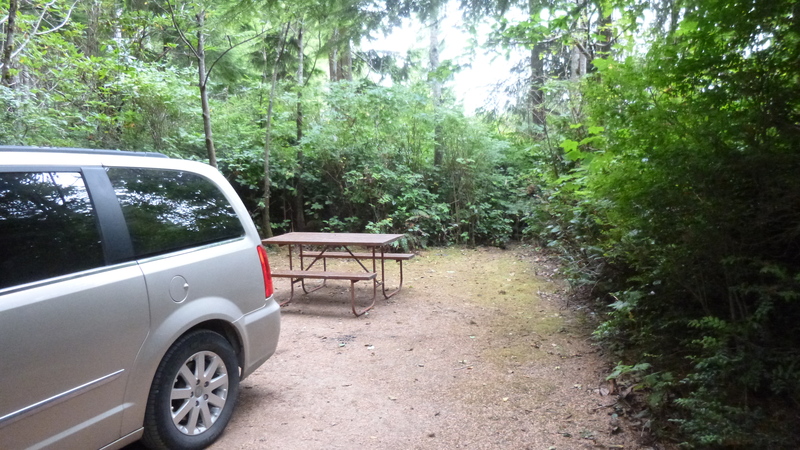 It was a very, very tight fit for the van, and I had to fold the mirrors in, but I made it through – just barely. Then I got to the part of the national park I was looking for, and dogs weren’t allowed on the trails, so Tula just stayed in the van. 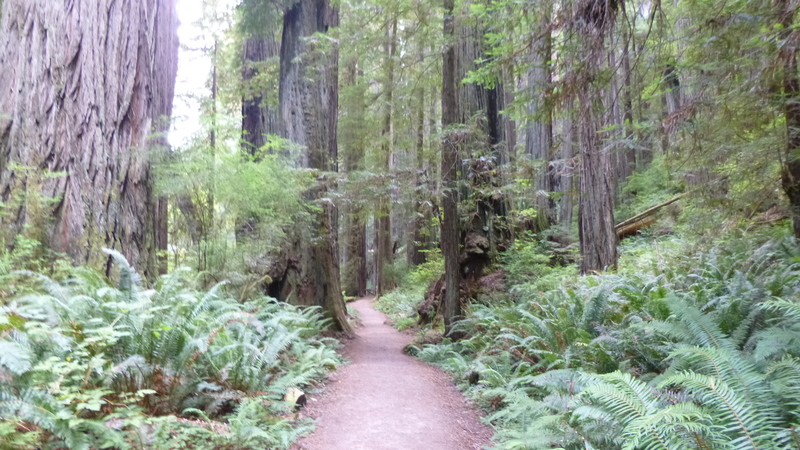 I walked 5 miles altogether through the forests of giant trees, and loved every step. 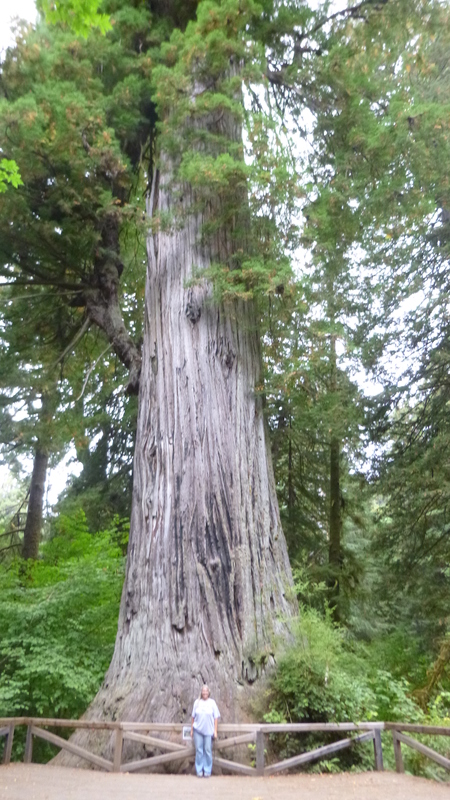 The trees are so tall that it made me feel very tiny. 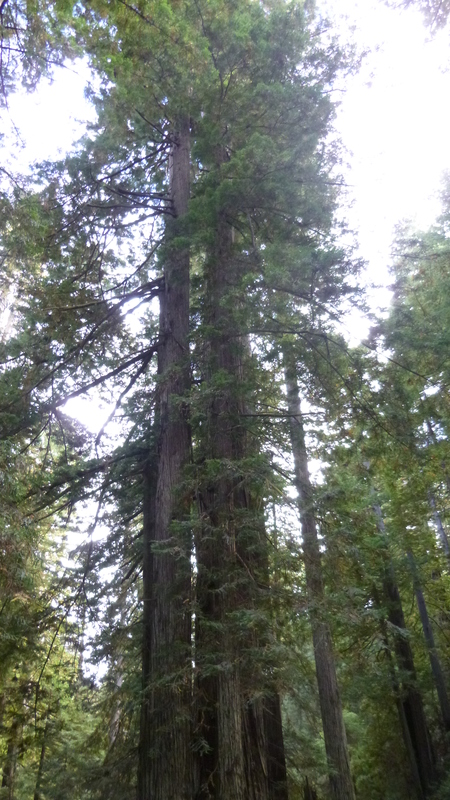 Even the ferns that grew on the forest floor were about as tall as me. I wouldn’t have been at all surprised to see a dinosaur poke its head out from behind a tree – it just seemed to be that sort of habitat! 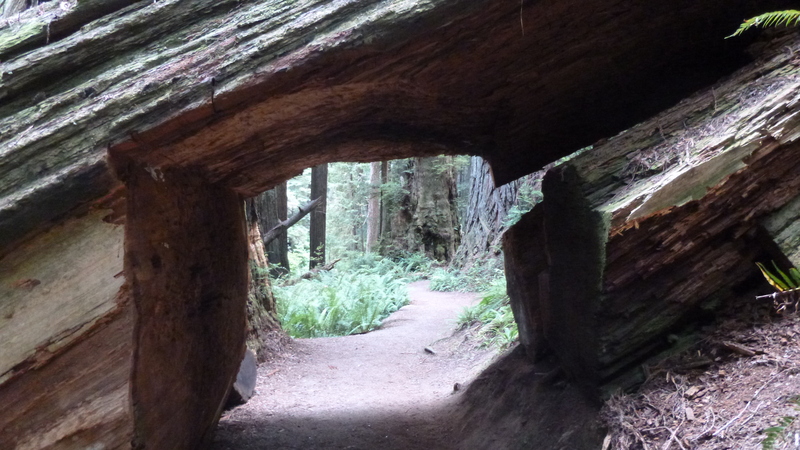 Apparently, once in a while a tree falls down, which blocks the trail because it’s so big, so the rangers just cut a “tunnel” through the tree – even though it was on its side, it was still too big to climb over. After I walked nearly 3 miles on trails on one side of the road, I crossed the street to walk on one of the trails over there. 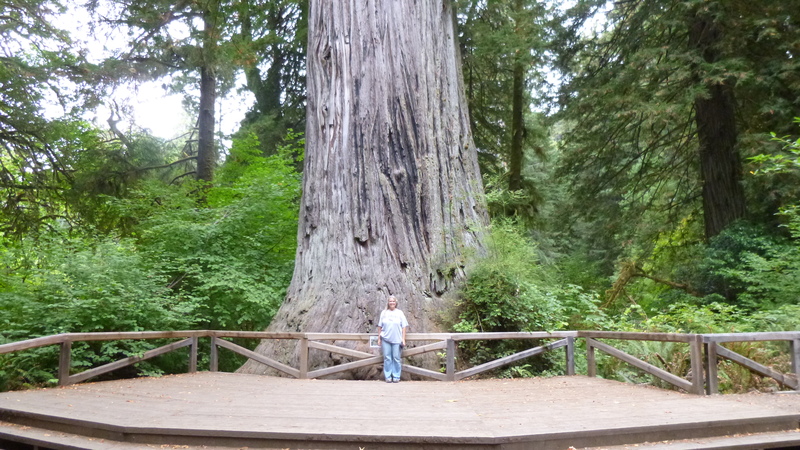 That’s when I came to the granddaddy of redwoods – a huge, wonderful old tree, named simply Big Tree. 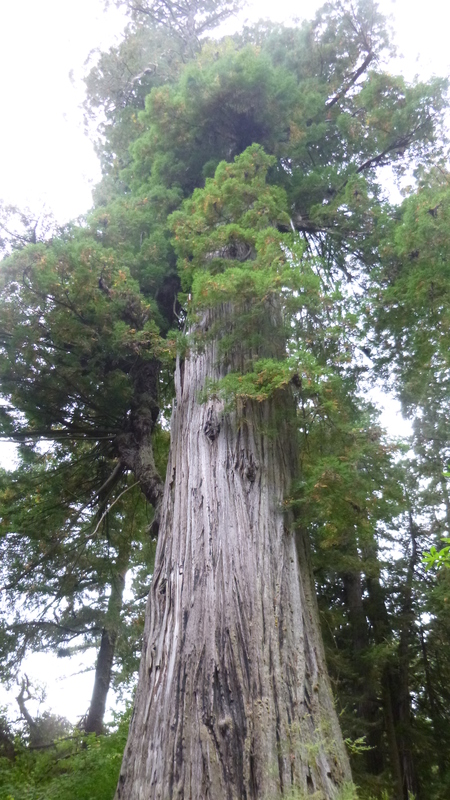 There was a sign with its statistics – 304′ tall; 21′ in diameter; 68′ in circumference, and it’s estimated to be 1500 years old – 1500 years!!! Amazing. America isn’t even 250 years old. 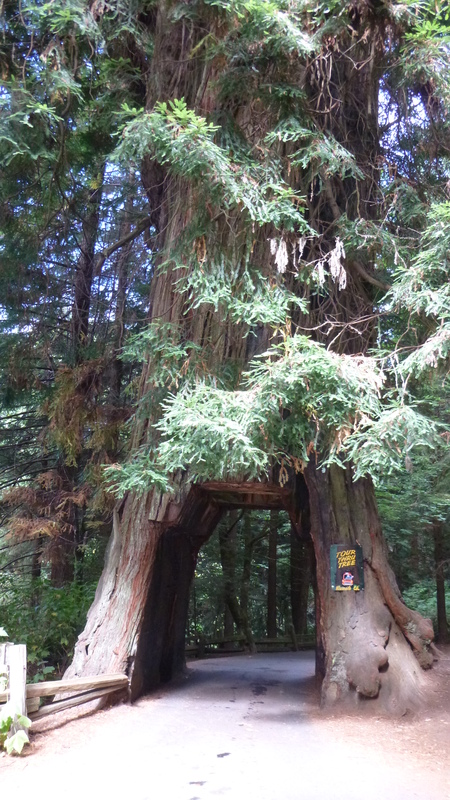 One of the informational signs said that back in the 1930s or so, someone wanted to cut the tree down to use the stump for a raised dance floor – luckily that didn’t happen. There didn’t seem to be many people out, and the forest with its giant trees was wonderfully quiet and peaceful – I’m so glad I was able to stop for a long walk. It was beginning to get dark, and I still had one more mile to walk. I found a beach area that had a bike trail a little closer to the road. 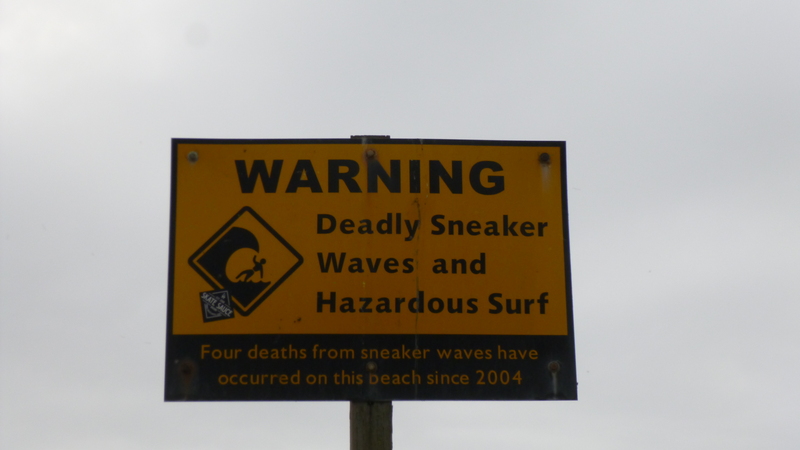 There was a sign saying to beware of “sneaker waves” down by the water – I don’t know what those are, but the sign said 4 people have been killed by them since 2004. So I wasn’t planning on walking down by the water. 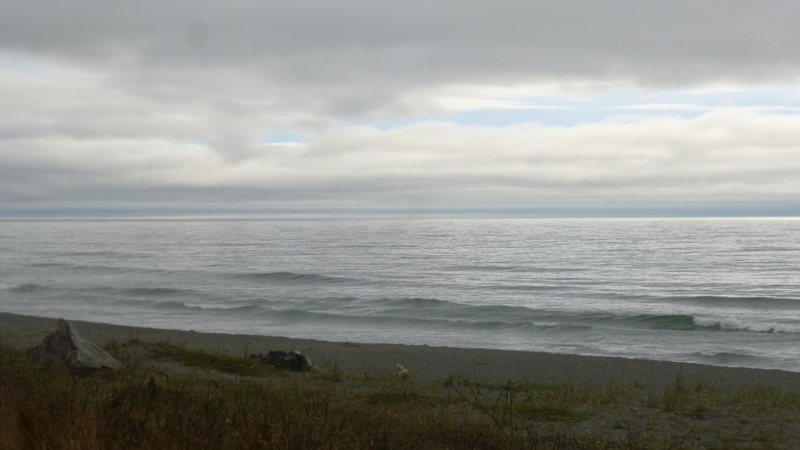 There were 3-4 surfers out on the water though, so they apparently weren’t concerned about the sneaker waves. With the sun going down, and the walking done for the day, it was time to give my California route some serious thought. I had talked with my brother near San Diego yesterday to let him know I would probably be staying in northern California for the week, then after I finished the state of Nevada, I would take a little 2 day “family break” to go over to visit him and his wife and daughter down in southern California. But then he told me this was the last week of the Del Mar horse-racing season, and they had a handful of horses at the track, and would actually have their horses racing both on Thursday and Friday. It had been a long time since I’d been to the races, and it’s always super-exciting to watch one of their horses run; so between Friday night races, and my birthday on Saturday, I changed my whole California plan, and decided to make the push to get all the way down to southern California by Friday evening. And so far I hadn’t made a lot of progress. I called ahead to make a motel reservation, then did kind of a long drive into the late hours of the night, just to get a start on some of the south-bound driving. I didn’t want to drive across any mountain ranges at night, so I mostly drove south and made some good progress and ended up in the small town of Ukiah. Happy birthday to you. I have enjoyed your journey thus far. Hugs to Tula. Jan of Redwood, NY Food pantry.